CREW (4th & 5th grade) At this PHASE in your child’s life, we know that friendships matter, and we have created a place to nurture those budding relationships. They experience game time, worship, an age relevant message, and small group breakouts led by consistent, caring leaders. • I will love God because He will never stop loving me. • I will follow Jesus because He knows me better than I know myself. • I will live out God’s story so others can know who Jesus is. We know that parents are the primary influence in the life of their child, that’s why we want to come alongside and equip parents to support their child’s faith. At the beginning of every series, parents will receive a Parent Cue which contains conversation starters that align with the current series. 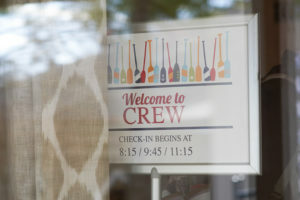 • To check your child in to CREW, you will find a computerized check-in system in the Children’s Auditorium. You will receive an “IN” and “OUT” slip (but they will not get a nametag). You will give the security member in CREW the “IN” slip and then present the “OUT” slip to check them out. • We have amazing leaders that come every week to invest in your child. It’s important to choose a service time and attend consistently for that relationship to grow. • There are snacks and drinks available for purchase for $0.50 each. • Each week your child will receive a “God Time” devotional. If they bring it back the following week signed, they will get a punch on a punch card. Once the card is filled, they can turn it in for a cool prize.